Nationwide mobile fuel drain services, we are the largest independent fuel drain provider in the UK with fuel doctors all over the UK to support you when you put the wrong fuel in your car. 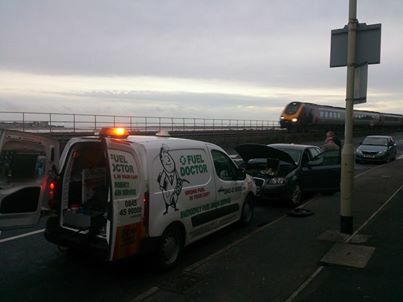 Here at Fuel Doctor we are very proud of the service we provide to our customers. We have worked tirelessly to develop a system that enables us to provide such a high quality service. Our customer focussed working practices place the safety of themselves and the public at the forefront of our technicians mind when performing a dynamic risk assessment prior to commencing work. Our bespoke system uses ATEX approved, explosion proof pumps, along with our own design of tank and fittings to enable us to carry out fuel drains on site, eliminating the need to have a vehicle recovered to a garage or workshop. The complexities of modern engines, combined with the vast range of different makes and models, require our Fuel Drain Technicians to be trained to the highest standards. On the odd occasion they encounter an abnormality, we have a 24 hour technical support line for any additional advice required. In addition to fuel system training, all Fuel Doctors are trained in customer services and disability awareness. Customer reassurance can sometimes be a Fuel Doctors most valuable on site skill. All of our vans are highly maintained both visually and mechanically to minimise down time. Fuel Doctor technicians also present themselves in a professional manner through corporate work wear, as well as being courteous and informative at all times. Health and safety is a high priority, with strict working procedures and practices that must be adhered to at all times. These include deployment of the appropriate warning signs and lighting where necessary, as well as an awareness of the duty of care we have towards members of the public and to the environment. Any queries or concerns that a customer may have will be answered by the technician, as well as a clear explanation of the procedure for draining the vehicle if requested. We offer a highly professional and cost effective solution to a very common problem. I came across a company called Fuel Doctor and rang them immediately. The chap I spoke to was friendly and reassuring and informed me that he would send a man over straight away. As promised, a Fuel Doctor van pulled up within the hour and got straight to work and the fuel drain was complete before I knew it.